Specializing in sofa, chair, bed, banquette upholstery design, reupholstery, repairs & restoration! At JARO we can restore your favorite furniture to its former glory no matter what condition it is in. We combine our strong knowledge of traditional skills with modern technology to return to you a quality piece you can be extremely proud of. At JARO we encourage your full involvement in the selection of products used to restore your piece. After we have conducted a full inspection of your piece we will advise you of all your choices and prices and let you make the decisions to suit your budget. You can also view and order from our large collection of fabric samples including the popular Warwick range. You will be inspired by the delightful colour, floral and pattern collections. We have something to suit all budgets. BRING YOUR OLD FAVOURITE TO LIFE AGAIN! 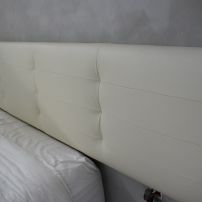 commented on "Cream Leather Bedhead with Square Stitched Panels and Blind Buttons by JARO Melbourne"
Luxury leather bedheads or headboards made to the size you require in a large selection of quality "Real" Leather. Matching bed bases, blanket boxes and chairs available. Talk to us about your requirements. Very simple to install yourself or we can do.